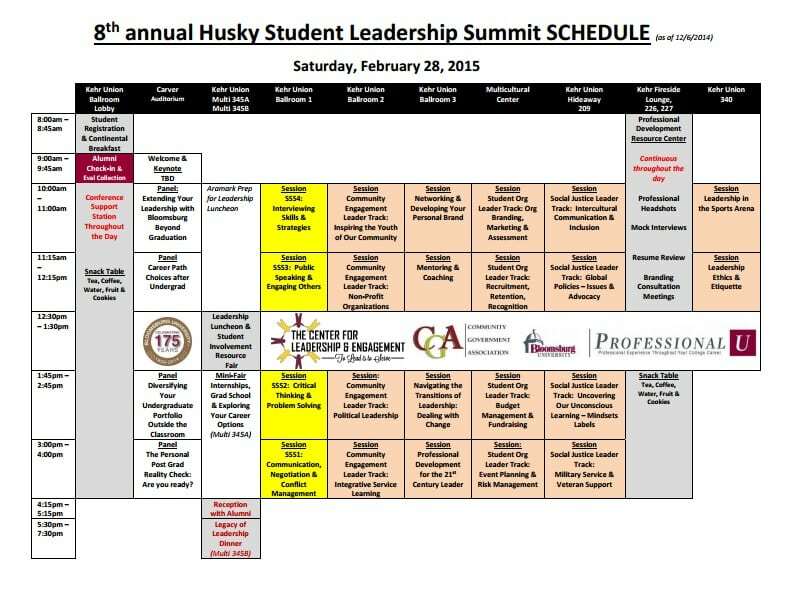 The eighth annual Husky Student Leadership Conference is almost here. The conference is hosted by the Community Government Association (CGA), Center for Leadership and Engagement (CLE), and Office of Alumni Engagement. It’s a an all day event that is free to students. It gives students the opportunity to network with Bloomsburg University alumni and gain leadership knowledge. It’s for all students, whether they’re currently a leader on campus or are aspiring to become one. The day breaks up into a series of sessions so students have multiple options on which ones they’d like to attend. Some sessions even count for the CLE certification. A copy of the schedule, as seen below, can be found here. Participants do not have to attend the summit all day; they have the option to attend whichever sessions they choose. So, just because the event runs all day doesn’t mean participants are required to stay the entire time. Students will not only be able to attend sessions like “Networking and Developing Your Personal Brand,” but they can also attend panel discussions; for example, “Career Path Choices After Undergrad.” There’s so many more options to choose from online, so you can create a schedule that works best for you. Along with sessions, students are welcome to participate in mock interviews, resume reviews, and getting their professional head shots taken. These particular resources are great for juniors and seniors getting ready to interview for internships or jobs. Why not try out your interviewing skills with experienced people who are happy to help you? To top it off, the conference will be serving a light lunch. This will give participants the opportunity to connect with alumni, faculty, and staff outside of the session (can you spell networking). During lunch there will be a Student Involvement Resource Fair so students can get a glimpse at some on-campus activities they may not have already been aware of. Next articleIs the Dress White and Gold or Black and Blue?